Alfred Stieglitz, the avant-garde photographer and gallerist who later became her husband, created a series of more than 300 photographs of O’Keeffe during the course of his life. SANTA FE, NM.- “New Photography Acquisitions” opened at the Georgia O’Keeffe Museum March 27, 2015. This exhibition presents a selection of the newest additions to the Museum’s photography collection, many of which have never been published or exhibited at the Museum. Alfred Stieglitz, the avant-garde photographer and gallerist who later became her husband, created a series of more than 300 photographs of O’Keeffe during the course of his life, beginning in 1917. Several images from 1918, are included in the exhibition. One is famous for picturing O’Keeffe in the act of painting (one of only two known to do so), while others, which have not previously been published, frame intimate moments at Lake George, where the couple spent the summer and fall at the Stieglitz family home. After Stieglitz’s death and O’Keeffe’s move to the remote village of Abiquiu in New Mexico, the artist continued to be a subject of interest to important photographers of the day, who journeyed to New Mexico and captured the artist in her environment, at home and in the landscape. Important portrait photographers such as Philippe Halsman, Yousuf Karsh, John Loengard, Arnold Newman and Tony Vaccaro followed her west. O’Keeffe friends Ansel Adams and Todd Webb, famous for their landscape photography, composed portraits of the artist–working the stark New Mexico scenery into the frame. Later pictures by Doris Bry, George Daniell, and Arnold Newman portray O’Keeffe in her New Mexico homes and in the surrounding landscape. The Georgia O’Keeffe Museum’s photographic archive numbers more than 2,000 images. It forms a valuable record of the many ways that O’Keeffe presented herself to the camera in formal portraits as well as in candid snapshots with friends and family. Since the Museum was founded in 1997, its collection of photographs has grown steadily, primarily through gifts. The largest gift of more than 1000 photographs was presented to the Museum in 2006 by the Georgia O’Keeffe Foundation. That collection, assembled by the artist during her long life, became part of her estate after her death in 1986. Similarly, the new acquisitions included in this exhibition, part of a collection purchased by the Museum in 2014, are unique because O’Keeffe selected the photographs for James Johnson Sweeney, the curator of her 1946 retrospective at the Museum of Modern Art. The acquisitions include a wide range of materials such as fine art prints, copy prints, negatives, contact sheets, and documentary photographs. RELATED: The Wall Street Journal: "Santa Fe is an unlikely center of photography"
"one of those giants, Art Shay, still walks among us"
SPOTLIGHT "ART SHAY: HIS LIFE AND LOVE"
The golden age of photojournalism may be long past, but the work of its giants—Walker Evans, Margaret Bourke-White, W. Eugene Smith, Henri Cartier-Bresson—continues to amaze and inspire. Many Chicagoans may not realize that one of those giants, Art Shay, still walks among us. A new exhibit at the Art Center Highland Park, "Art Shay: His Life and Love," combines many of the greatest hits of his long career as a shooter for Time, Life, Fortune and many other mid-20th-century photography showcases, with a subgroup of more personal images of his 67-year marriage to Florence Shay, a rare-book dealer in Highland Park. The photos of Florence, who died in 2012 of cancer, are included in "My Florence: A 70-year love story," published in January. These are among the most poignant images in the show: vivacious and flirty in Las Vegas, hard at work at her book shop, in the latter stages of terminal illness. More immediately accessible to many viewers will be Shay's candid and uncannily revealing portraits of many of the 20th century's leading figures, including Marlon Brando, Muhammad Ali, John F. Kennedy and Martin Luther King Jr. In every case, Shay, now 92, captures his subjects in some unguarded moment that suggests an aspect of his or her personality that was rarely glimpsed. The show also includes some of Shay's hidden-camera work. "I once shot some photos at a Mafia trial in Columbus, Ohio, in a courtroom where cameras were not allowed," Shay says. "I later got a letter from the prosecutor that said: 'Mr. Shay, the next time you are seen in Columbus, you will be subject to arrest for using a camera in the courtroom. P.S. : How did you do it?' "
Monroe Gallery of Photography will feature several of Art Shay's photographs during the AIPAD Photography Show at the Park Avenue Armory (Booth #119), April 16 - 19, 2015. Three Western Pennsylvania historical sites were among 22 selected by the Pennsylvania Historical and Museum Commission to receive the familiar blue and gold commemorative roadside markers. Markers will be placed at or near the site of George Westinghouse’s gas wells in Point Breeze, in New Kensington to honor Pulitzer Prize-winning photojournalist Eddie Adams and in Erie to memorialize the iconic “Don’t Give Up the Ship” battle flag from the War of 1812. Dates for installation and precise locations of the markers are not determined until local interests have raised money to pay for the markers, said Howard Pollman, spokesman for the commission. The cost ranges from $1,400 to $1,875. “They are usually placed as close as possible to the place where the event took place or the person lived,” he said. Mr. Westinghouse began to experiment with natural gas extraction in the 1880s, when he also was pioneering electricity generation. He drilled four wells at the site of his Point Breeze estate. Mr. Adams is best-known for a photograph, taken in 1968 during the Vietnam War, of a Vietnamese police chief firing a bullet into the head of a Viet Cong prisoner from arm’s length range on a Saigon street. The image appeared worldwide, including on the front page of The New York Times, and galvanized opposition to the war in the U.S. The Pulitzer Prize he won for the image was one of about 500 photography awards he received during a career that saw him cover 13 wars. The commission said Mr. Adams got his start as a photographer in his hometown of New Kensington, shooting photographs for his high school yearbook and as a staff photographer for the local newspaper. He died in 2004 and was buried at Greenwood Memorial Park in Lower Burrell. Seven Erie women created a battle flag in the summer of 1813 for Oliver Hazard Perry to fly on his ship, the Lawrence, in the Battle of Lake Erie. The slogan was from the last words of Capt. James Lawrence and became a rallying cry for the ship’s crew, which helped to defeat the British in the pivotal battle. Replica flags with “Don’t Give Up the Ship” are displayed throughout Erie, which held a yearlong celebration of the battle’s bicentennial in 2013. Mr. Pollman said the marker likely will be placed near the Erie Maritime Museum, home to a full-sized replica of the Brig Niagara, which also took part in the battle. The commission selected the 22 markers from a pool of 50 applications. Currently, nearly 2,300 historical markers are in place throughout the state. More information on the Historical Marker Program, including application information, is available online at www.pahistoricalmarkers.com. 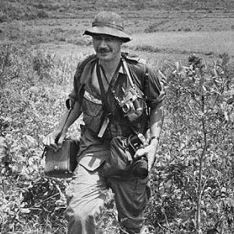 Monroe Gallery of Photography will host a major exhibition of Eddie Adams' photographs in Spring, 2016, in conjunction with a new book of Adams' Vietnam photographs by the University of Texas Press . Join Robert Caplin and Alyssa Adams, deputy photo editor at TV Guide, for a LIVE video podcast recording in NYC. They'll be talking about her career in photography, the Eddie Adams Workshop, business, networking, and much more. This event is open to the public to attend both in person locally in NYC or online at http://thephotobrigade.com/LIVE. Monroe Gallery of Photography is proud to represent the Eddie Adams Estate. Watch for a major new book relase of Adams' Vietnam photographs and a major exhibition in Spring, 2016 at Monroe Gallery. On this day in 1945, U.S. and Filipino soldiers recaptured Manila.